The problem with the daily news media is that it's obsessed with what's happening right now, when in fact the real stories often takes days or even weeks to emerge. And the problem with daily newspapers is the same, plus that they are universally awful, full of acres of space-filler advertorials and unnecessary opinion pieces - and that's without mentioning the overt and appalling bias of nearly all of them, and their increasingly desperate delusions of relevance. When I discovered The Week about six years ago, it seemed like the ideal answer - just the most important facts about the most important stories, each week. It's still the best news digest I've come across, but this is my last one. It's expensive for what it is - over £100 a year for a slim magazine each week - and it's not exactly a digest of the week's news; it's a digest of the week's news media. This means that alongside the actual news item, we get a summary of how it was reported, and as much space is given to the hot air produced by the rent-a-quote whores in rags like the Daily Mail or The Sun, as to more considered opinions in the Torygraph or the Grauniad. Even in this compressed form, I'm tired of the predictable and tedious bias. I'd rather just have the facts. These days, I find myself skimming the BBC News site a couple of times a day; it's balanced (if you disagree, all you're really saying is you wish it was more weighted towards your opinion), well presented and informative. And free. Presumably, "well compiled, written and designed" is too mainstream. This second volume covers what what was probably Chris Evans' most notorious period in the public eye - from buying Virgin Radio, to taking over the Radio 2 breakfast show. He's obviously had some great times and some bad times, and worked hard and played hard. He skims over the bad times and the hard work, and gives us lots of vignettes about the good times and the play. Each chapter is short and easily digestible. Great fun, doesn't outstay its welcome and more than a little envy-inducing. 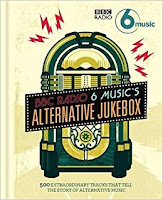 BBC 6 Music has been called a "dedicated alternative music station", although it prefers to describe its music policy as including the "cutting edge" and "ground-breaking" music of today and the past. Unfortunately, defining any of these terms is a bit like nailing jelly to a wall. Jeff Smith and James Stirling (respectively, Head of Music and Editor at 6 Music) give it a bash in the introduction by referring to an "alternative spirit", but this hardly improves our understanding. The patchiness of the choices doesn't help us either. Giant mainstream hits rub shoulders with wilfully obscure world music. Obvious tracks that form the bedrock of today's "indie" mentality are overlooked in favour of below-par album tracks. It's all very odd. For example, the only Velvet Underground track included is "Who Wants The Sun", a trite piece of pop whimsy from Loaded. Granted, that's an alternative to the usual VU classics, but not a very good one. If someone's coming to "alternative" music for the first time, they'll need to know about "Venus In Furs" and "I'm Waiting For My Man" - or, if you must, "Sweet Jane" and "Rock & Roll". Listening to "Who Wants The Sun" won't give any insight into an alternative spirit, or into why VU are so revered. There are a number of selections from 6 Music presenters but otherwise no mention is made of who chose these tracks. However, poor Lloyd Bradley was clearly then handed a giant playlist and given the daunting task of saying something meaningful about each one. Too many of the brief write-ups are ham-fisted and it seems clear that he was struggling; there's no NME cliche left on the shelf, or trite observation left unsaid. So a patchy selection is then poorly served by what's written about them. To cap it all off, the design and layout of the book appears to have been done by sixth formers who have just discovered clip art. It's a bit tacky, a bit cheap and a lot unsuitable. There are many tracks here I've not heard before and working my way through the playlist on Spotify is good fun. But the book is below par. Just listen to the songs.